3rd Annual Zombie Crawl - Land O' Lakes Area Artisans, Inc.
We’re dying to havE you join us for the 3rd Annual Zombie Crawl on October 27, 2018 in Land O’ Lakes. PLEASE KEEP SCROLLING DOWN FOR TICKETS. LOTS OF DEVILISH DETAILS! Halloween Hats – 4:00 p.m. – 6:30 p.m – $25.00 per person – All materials supplied. No costume? No problem! LOLA’s got you covered! Appetizers & Beverages included. Learn more about the Fox Valley Ghost Hunters! Zombie Dolls – Barbie of the Undead! – 10:30 a.m. – Noon – $20 per person – All materials supplied. Dream Barbie, Bride Barbie, Astronaut Barbie – and yes, Zombie Barbie! Create your own bizzarely beautiful un-dead doll! Then, take Zombie Barbie or another 12” doll along for the crawl. The LOLA Creative Crew has a bit of a twisted side, so come enjoy some freaky fun! THE ZOMBIES ARE HUNGRY! TELL US ABOUT THE CRAAAAAAAAAWL!! 5:00 p.m. – 9:00 p.m. Shuttle Buses will run the Zombie Crawl route continuously. 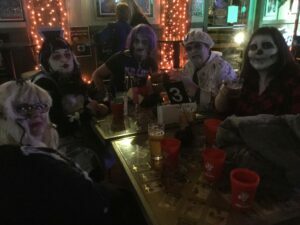 Some of the Deals to Die For Include: Drink Specials at The Alley Lanes, Live Music and Midnight Zombie Feeding at Brews Pub, Pizza by the Slice at T.J. Grizzlies, Drink Specials at Bear Trap Inn, Live Music starting at 8:30 p.m. at Bent’s Camp, D.J. and Free Photo Booth starting at 6 p.m. at The Black Oak Inn, Zombie Drink Special at The Gateway Lodge, and Drink and Appetizer Special and Raffle Drawing for Free Dinners at The Twilight Supper Club ! Free! Listen to our sinister story tellers who will be spinning spooky yarns about Northwoods. Does Land O’ Lakes we have a dark side? Find out! Free! Join more Northwoods characters for a tour of the Gateway and get to know the ghosts of the hotel. Tour at your own risk. Free! Join the Fox Valley Ghost Hunters, led by founder, Craig Nehring, to see a slideshow of their best out of state investigations for some creepy fun! Need to get rid of that pesky poltergeist? The FV team will share how to get started. AND NOW FOR THE MAIN EVENT! THE 3rd ANNUAL LOLA ZOMBIE CRAWL! 1. Get your RED ZOMBIE CUP and the Map of Deals to Die For. Some establishments will have spooky specials on drinks & eats! CUP ONLY $5.00. Pick up your cup at The LOLA Center for the Arts, 4262 County Road B, Mon-Sat. 10 a.m. – 4 p.m., Sun – 10 a.m. – 2 p.m. Cups will be available until 4 p.m., Sat. the 27th. Costumes optional but fun! You don’t have to be a zombie to participate. 4. MORE NEW! Designated Driver BODY BAG -If you have a group of 3 or more and choose to provide your own transportation with a designated driver instead of using the shuttle, your designated driver will receive one free make-up: zombie/ghost/ghoul and all the Body Bag goodies. The free DD ticket MUST be reserved at the same time as the three or more other Body Bag Up-Grades. Each Body Bag will contain: the Red Zombie Cup, the map, some ghoulish goodies, plus a mini-bag for collecting body parts (don’t worry – not real!) at participating businesses. Returned body parts will be your entry for a GRAND ZOMBIE PRIZE! Red Cups & Body Bags may be purchased below online or at the LOLA Center Office. Zombification appointments must be made with the LOLA Office. 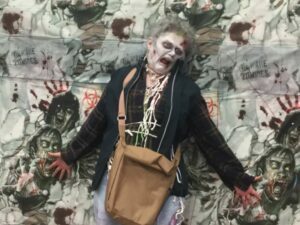 All Body-Bag Up-Grades (aka Zombifications) MUST call the LOLA office at 715-547-3950 to make an appointment after Body Bag ticket has been purchased. You will receive your Body Bag goodies at your Zombification appointment. Zombifications will be done on the day of the event at the Land O’ Lakes Town Hall from 3:00 – 8:00 p.m. The Town Hall is located at: 4331 County Rd B, Land O’ Lakes. BODY BAGS & APPOINTMENTS must be purchased & made by OCTOBER 24 at 4 p.m. The LOLA Center for the Arts, 4262 County Road B, downtown Land O’ Lakes. Remember, you do NOT need to dress up as zombie to participate in the Zombie Crawl. Just buy your Red Zombie Cup and join in the fun!